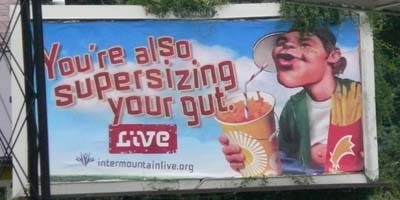 I wrote before about this advertising campaign in Utah. This is what happens when people who don’t really understand what it takes to be healthy design advertising campaigns for health. It’s not the creme-filling. It’s not the cupcake. It’s the fact that I ate three or four cupcakes in one sitting. It’s not the food, it’s the quantity. A cupcake every once and a while is just fine. It’s when it’s a habit that it becomes dangerous for me. 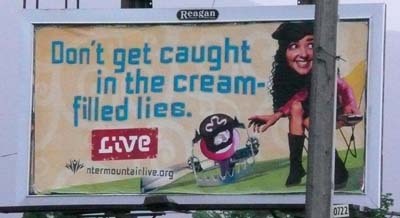 They’re not creme-filled lies. They’re just food. It’s my lack of control over the food that’s the problem, not the food. This one makes a little more sense, but it’s still offensive. Eating treat foods in moderation are just fine, but super-sizing your food and eating fries on a regular basis could be a problem. I know it’s hard to gain weight eating too many carrots, but the fact is, these foods are part of our lives. We need to learn how to incorporate them into our diet AND be healthy. Creating a stigma regarding certain foods, merely creates a Good Food – Bad Food dichotomy in my mind. When I’m feeling negative, I end up eating too many Bad Foods. If I can knock down the idea of Good Foods and Bad Foods, I end up eating a lot healthier. Previous: The Fit Flop: How About Just Flop?